We finally did it, SC solid steering rack bushings for the driver's side post mounts. 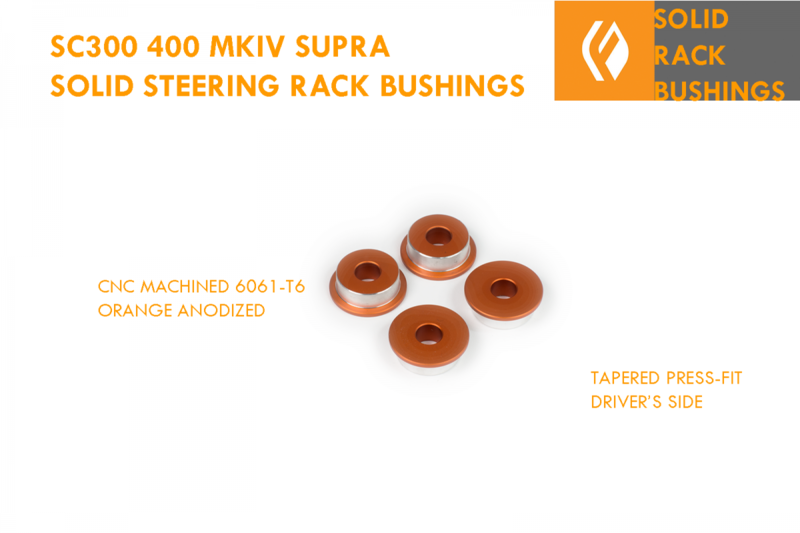 Easy to install, these tapered bushings hold the rack in position under load. Perfect for drift cars that have modified knuckles. The first of a series of solid bushing kits, these alumium bushings press fit into the steering rack and eliminate any squirm in the steering. These are two sided with a press-fit side and a spacer side. 6061 aluminum, machined and knurled and now ORANGE anodized. Install: These will install without removing the rack but care should be taken to not bend the pressure lines. knock the old bushings out with a hammer and chisel, air chisel or ball joint press. Install the new bushings by hand initiall then final press the last .020" to full seat. Contact FIGS with questions. PLEASE ALLOW UP TO 3 WEEKS FOR BC TO ACQUIRE THE COMPONENTS AS EACH COILOVER IS BUILT TO ORDER. AF..
BC Racing steps up again to provide a 2-Way adjustable Coilover with a remote reservoir at a great .. THIS IS OUR UNIVERSAL APPLICATION ORDER SHEET FOR ALL BC BR SERIES COILOVERS.FOR ORDERING PLEASE W..
BC Racing steps up on the FR-S Platform to deliver a great kit at a great price. Technical Spec.. PLEASE ALLOW UP TO 3 WEEKS AS EACH COILOVER IS BUILT TO ORDER - CONTACT US WITH QUESTIONS	At the '0.. These bushings replace the staked rubber bushings on the Front Lower Control arm on the front moun..
Includes cups and threads to drive in just about any bushing imaginable. We found it a great asse.. This is a ball joint service tool that seems to be just perfect for pressing out the lower knuckle.. Swift makes a second to none spring and FIGS is pleased to offer a specific upgrade option to any .. Dial in your up-travel stops on coil over suspensions. These easy to use Jounce Bumper Spacers all..
A long time in the making, these fabricated lower control arms offer 2.5 degrees of gross .. There has always been a problem with the front LCA on the Toyota Supra and Lexus SC, the ball .. The brand new KW Variant 3 coilover kit with its individual adjustable compression and rebound dam..
2-3 week build timeTo complement our adjustable front LCA, we have developed an upper control arm fo.. The Ultimate in driver feel for the track and spirited drivers, the DR series delivers that edge fo..